What is a Turbo-Look and how did it come to this model? What is, actually, the Turbo-Look which is classed with the option code M491? With the appearance of 911 Turbo in 1974 this name develops first generally usage of the enthusiasts, however, was chosen later also as an official term from Porsche. (always in the manner of writing with the hyphen). "Turbo-Look", certainly cleverly more elective, on all markets concept slightly to be understood which explained by no means only the external appearance, but walked along with the revaluation of the image of the otherwise rather simple Porsche 911 SC or Carrera. Immediately after appearance of 911 Turbo the first non-charged, narrow cars to the external appearance of the top-of-the-line model were adapted. This happened at first mostly in smaller workshops and, unfortunately, often also in dubious quality, but also the repair department of the mother's house Porsche was to be given slantwise to a good rebuilding order under use of Porsche genuine parts no "no we don´t". Basically should be observed that with every model change, but completely particularly after the presentation of the top-of-the-line model Turbo, that some owners wanted to drive up in the newest model or its look but without investing immediately the full purchase price of this model. If one wanted to shine as an owner of a putative Turbo, the interventions were very extensive in the car body substance, nevertheless and were costly and thus it does not surprise that also Porsche took up the rebuilding as a commercial model and did not want to leave possibly orders to foreign suppliers. What did first the repair department, the "special wish department" took up during later years and offered the rebuilding as an Exclusive option. Many tuners and vehicle builders satisfied customers desire for the brutal appearance, sometimes, unfortunately, in very questionable quality! 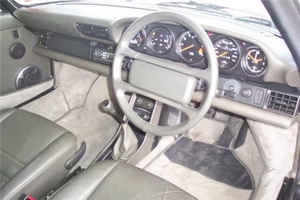 The option 491, the Turbo-Look, received official move in the sales lists, and with it in the serial production, about 10 yearsafter presentation of 911 Turbo, so in the modelyear 1984. It was classified at this time still as an individual code and the correct name in the first years was: I491. First the order was possible and was planned without inclusion of the special wish department (today Porsche Exclusive) only for the Coupé. 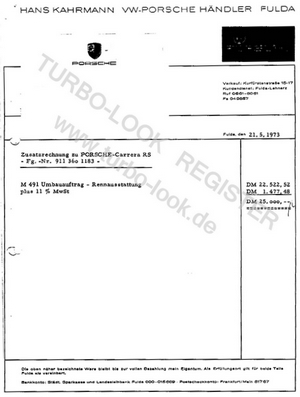 However, some cabriolets were still ordered and also provided with all insignia of the Turbo-Look, however, without having the option code I491 in the internal data sheets (cardex). For these cars the department "Sonderwunsch" was once more responsible. Then from model year 1985 were orderable all three model variations of Porsche 911, so Coupé, Cabriolet and also the Targa with the option I491 and were produced beside their narrow counterparts on the standard production belt. 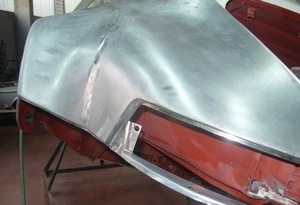 were attached like with the Turbo first as welding parts to the narrow fender – from model year 1986 a new, widened fender as one piece was developed. up to modelyear 1986 widened parts were attached to the at first narrowly pressed vehicle side panels. From modelyear 1986 on the whole side panel was produced as one widebody part. 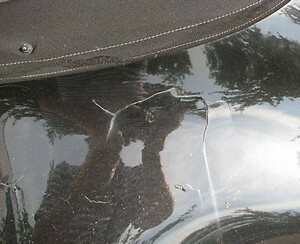 The service information reads: "The visible from inside weld seam is omitted. 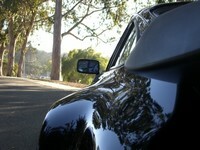 The drawing part is now manufactured in one piece"
The front apron with elastic spoiler set in the side parts. 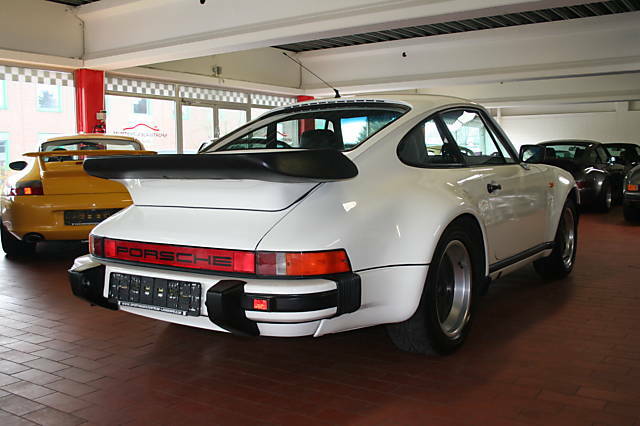 The Turbo rear wing with the elastic lip of the Porsche 930 3.3. One could cancel the front spoiler and back spoiler - first without change in price, but the package price decreased later about 2000 - DM. Such vehicles were documented, in addition, with the option M470. The complete brake assembly of the Turbo 3. 3, derived by that of Porsche 917.
on the rear longer wheel bolts were obstructed and distances of 23 mm were used for the vehicles with G 50 gear from model year 1987 on to bring the gauge on 1492 mm. The at most possible width capable of registration of distance discs are 43 mm. The Bilstein chassis of the Turbo (green sports shock absorbers in front axle and rear axle) – the Boge damper analogously to the versions which also found in the narrow variations of the Porsche 911 use, were obstructed. The tie rods of the Turbo which renounced the susceptible elastic-stored joint in favour of a ball joint. This vehicle, delivered with the chassis number WP0ZZZ91ZDS102016, was provided with the individual equipment according to Z application 00297 among other M-Codes (I327, I777, M186, M197, M261, M469, M499, M559, M568) and is in its totally original state. Porsche awarded for these cars also an own M(I) code. The I777 classes the TURBO-LOOK build around with 13 coupes - two targas and two cabriolets. All cars MY. 1983 and only for German markets (C00)! What all of these rebuilding's, as well as the preceding copy have in common is that they only implied optical changes. Technically everything remained the same. Finally, however, the Porsche superiors saw it. Besides the upcoming "Tuning" market, it was decisive that the fact that 911 Turbo stood in the USA already from 1980 on the basis of exhaust gas laws on the spring, and many potential US buyers of the top-of-the-line model should be supplied with a wide variation to protect at least the "look". It was - from today's perspective, regrettably - awarded no independent chassis number for the rare in the Turbo-Look-made vehicles. In the UK, the car was named "Carrera Turbo Look - Special Sports Equipment" and in 1987 officially "Super Sport". The UK-markets (C16) became more apparent as of model year 1986 or about September 1985 - just two earlier vehicles (MY 1985) exist, In the end it was the best market for Porsche AG and the Carrera Turbo-Look up 1989th. It is interesting that an above-average number of vehicles were delivered with corresponding body color seat piping (Z04241).